Qatar Duty Free (QDF) is pleased to announce the launch of the first-ever airport branch of the award-winning Qatari brand, Al Jazeera Perfumes, at Hamad International Airport (HIA). The new airport outlet brings travel shoppers a premium selection of perfumes blending traditional Middle Eastern aromas with distinctive Parisian scents. Located in Concourse C adjacent to the iconic Lamp Bear, the boutique combines elements of Al Jazeera Perfumes’ Middle Eastern inspiration with a sleek contemporary twist. 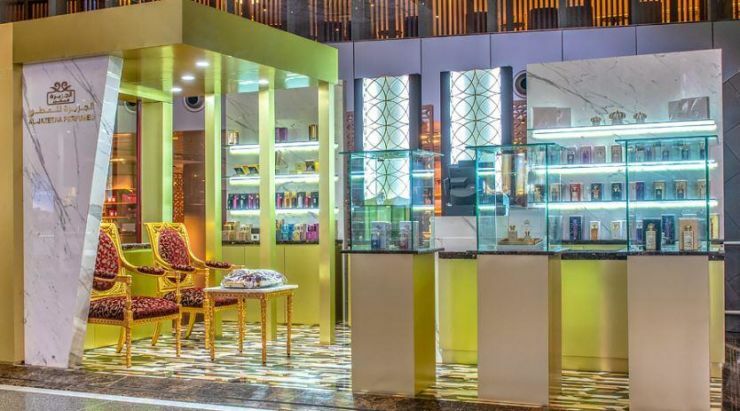 The royal gold-themed airport shop brings the brand’s high-street concept to the heart of HIA and will showcase a selection of best-selling fragrances, including Magic and Malachite. In addition, the store offers a special fragrance collection of the finest quality from Montale Paris, the French ambassadors of oud. Al Jazeera Perfumes breezed into the world of fragrances and perfumes in 1998, and achieved immediate success in Doha. The brand continued to expand its footprint by opening a number of branches in Oman and Kuwait, as well as an exclusive store at the heart of Champs-Elysees in Paris, France. In 2017, Al Jazeera Perfumes was named ‘Brand of the Year’ at the World Branding Awards at Kensington Palace in London. QDF boasts more than 90 elegant and luxury, high-end stores, as well as more than 30 restaurants and cafés covering an area of 40,000 square metres at HIA, providing travellers with a world-class shopping experience under one roof. Luxury brands also available at the five-star airport include Tiffany & Co., Gucci, Bulgari, Hermès, Burberry, Hugo Boss, Moncler, Rolex and Harrods. In addition, the award-winning duty-free retailer regularly showcases podiums and pop-up stores including the Maison Christian Dior boutique, a TUMI Pop-up, the Dior Les Parfums and the Aigner Luxury Boutique. HIA, the home of QDF, has already met several significant milestones in 2018, including being ranked fifth ‘Best Airport in the World’, fourth ‘Best Airport for Shopping’ and fifth ‘Best Airport for Dining’ at the Skytrax World Airport Awards 2018.